The walls in the child’s room will help create a cozy sanctuary and a friendly space for play and learning. 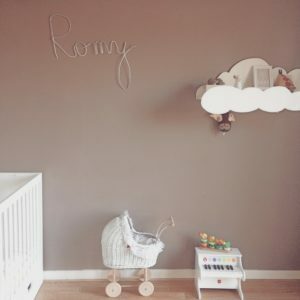 Choosing the color of paint for the children’s room, it is worth following the tastes and aesthetics of the rest of the flat, and the preferences of our child. The most effective rest and the best fun will be ensured by the interior that simply appeals to the child. Shiny and semi-matte paints are the easiest to keep clean. It is recommended to check by the purchase how a producer of a particular type of paint determines the number of washing cycles. The washable paint is more than 800 washing cycles, those with a number of cycles of 150 are not suitable for wet cleaning. The most resistant to scrubbing are latex paints, which additionally transmit water vapor. Safe and non-allergenic paints for the children’s room are characterized by their water-dilutability – the turpentine, gasoline and alcohol do not release from the child’s health. These are mainly dispersion paints (those tested with a small amount of organic solvents), glue and mineral. Smooth walls (gypsum plasterboard, gypsum plaster) are the smallest, while the most dust and mites settle on uneven surfaces, such as mineral plasters with grains of sand. In allergy-free rooms one should avoid using structural paints or laying plaster and wallpaper with clearly noticeable texture. An interesting solution for the children’s room are also luminescent paints (glowing in the dark) to cover fragments of walls or create decorative elements. Available in several colors, they are illuminated with daylight and the effect can be enjoyed after dark. Children’s rooms are ideally suited wallpaper washable, covered with a layer of almost invisible plastic. In turn, acrylic, one-colored or patterned wallpapers, after heavy dirt, can be painted over with most paints. The kitchens often use vinyl wallpaper, which is a good solution for the walls of our child’s room. They are very durable, inexpensive and suitable for scrubbing even with chemical detergents without fear of losing the intensity of the color. On the wall painted with paint or directly on the wallpaper, you can stick simple wall decorations, such as multi-colored self-adhesive stickers. They are fastened with lightning, and after detaching the better-quality models on the surface of the wall, there are no unsightly marks. Patterns are adapted to the changing interests of the child, and the choice is huge: from the favorite heroes of cartoons, through nautical motifs, geometric, animal, to space ships and fire engines or police cars. Wall stickers also appear in the form of individual letters or inscriptions. This type of decoration is also easy to create thanks to handy templates, which simplify the work of less talented parents. Previous PostPrevious What is Marketing Automation and Why Do I Need it?